Want to experience agile in an accelerated form and focus on innovation at the same time? Try an agile FedEx day! A while ago I wrote about Slack and FedEx Day and why I think its important to have slack in the system, and why a FedEx Day is a good way to to run an innovation day. A few days ago we had the first inaugural AgileSparks FedEx Day. Since we are, after all, a company which believes in agile approaches, we decided to some dogfooding an run our FedEx day in an agile form. We started with identifying the Goal of the day and then decided on a few key themes the innovations should focus on. This was done offline a couple of days before the actual FedEx day. For example, one of the themes was “Process Innovation – Things that will enable us to do our work more effectively and bring more value to our clients”. With those themes defined, we opened the floor to brainstorming of ideas to work on. This as well was started offline, by sharing a google spreadsheet where each member of the team could add his ideas. Some of us had some ideas in mind, some of us came as a “Clean Slate”. Then we looked at the ideas, collected on a sunny window, both ideas from the spreadsheet as well as other ideas that came up during the warm-up and gathering time. Each of us had to choose an idea he is excited about, and that is how we did team formation. We came up with 3 teams each working on a different idea. We then started sprinting! we did 4 sprints of an hour, including planning, demo and retrospective. The demos included the whole team. During the sprints we worked on elaborating our ideas, using Agile User Stories and techniques such as story mapping, as well as started implementation and delivery of “Working Software”. It proved a real challenge to deliver on such short sprints, especially for those of us who didn’t have a somewhat formed idea at the starting point. 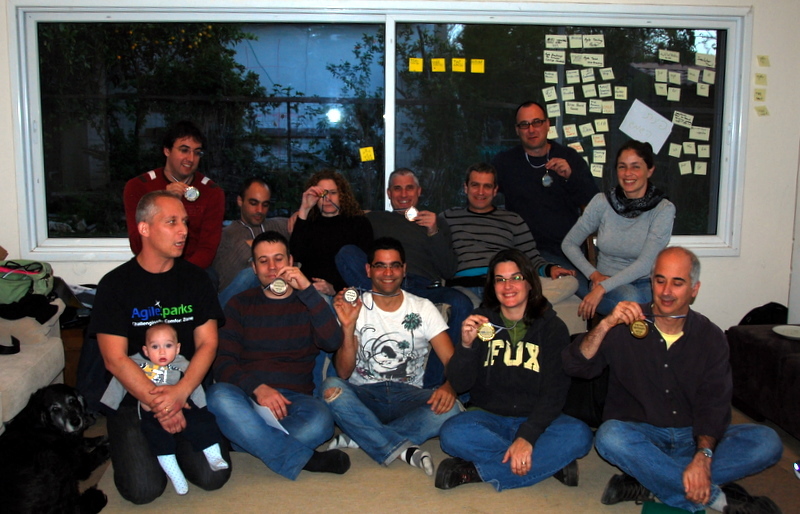 At the end of the day we gathered to retrospect on the whole experience and choose the winning idea. We decided that it was a great experience, that pushed forward several important ideas, as well as gave us the opportunity to experience on our environment some of the practices and approaches we are helping teams with. Making a real dent in a cluster of small technical debt areas, or a big technical debt. Have you thought about running a FedEx day in your team/company? If you have been sprinting/churning for a while now, and want to change gears, consider something like a FedEx day. If you also try some new lean/agile practices while at it, you get double benefit! We believe that exercises/games bring accelerated learning of any new approach to doing things. One of the cool things about a FedEx day is that its a mix of accelerated delivery as well as accelerated learning. If you are interested to hear more about this, or would like our help in planning or facilitating such a day – let us know! This entry was posted in Agile, Innovation and tagged Agile Transition, experience, team, technical debt on January 21, 2011 by Yuval Yeret.